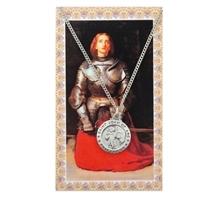 These patron saint medal sets make a perfect gift for any occassion. Pendant is Oval shape and made of pewter and paired with an 18" lite stainless steel chain. Prayer card is laminated, with saint image on the front and associated prayer printed on the back. Pendant is oval shaped and made of pewter and paired with an 18" lite stainless steel chain. Patron Saint pewter medal on 24" chain. Medal is approximately the size of a dime. Pendant is round shape and made of pewter and paired with an 18" lite stainless steel chain. Medal is a bit less than the size of a dime.